Beowulf clusters, which exploit mass-market PC hardware and software in conjunction with cost-effective commercial network technology, are becoming the platform for many scientific, engineering, and commercial applications. With growing popularity has come growing complexity. 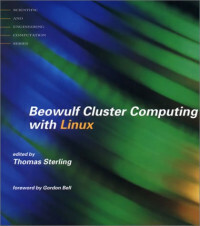 Addressing that complexity, Beowulf Cluster Computing with Linux and Beowulf Cluster Computing with Windows provide system users and administrators with the tools they need to run the most advanced Beowulf clusters. The book is appearing in both Linux and Windows versions in order to reach the entire PC cluster community, which is divided into two distinct camps according to the node operating system. Each book consists of three stand-alone parts. The first provides an introduction to the underlying hardware technology, assembly, and configuration. The second part offers a detailed presentation of the major parallel programming librairies. The third, and largest, part describes software infrastructures and tools for managing cluster resources. This includes some of the most popular of the software packages available for distributed task scheduling, as well as tools for monitoring and administering system resources and user accounts. Approximately 75% of the material in the two books is shared, with the other 25% pertaining to the specific operating system. Most of the chapters include text specific to the operating system. The Linux volume includes a discussion of parallel file systems. Provides system users and administrators with the tools they need to run the most advanced Beowulf clusters. This Linux volume includes a discussion of parallel file systems. Softcover. Thomas Sterling is Senior Staff Scientist in the High Performance Computing Systems Group at the Jet Propulsion Laboratory.